International variation in Deaf Communities. 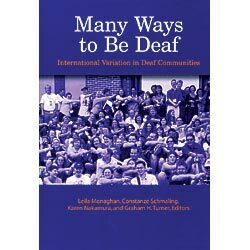 Many Ways to Be Deaf presents an unmatched collection of in depth articles about linguistic diversity in Deaf communities on five continents. Twenty four international scholars have contributed their findings from studying Deaf communities in Japan, Thailand, VietNam, Taiwan, Russia, Sweden, Austria, Switzerland, Great Britain, Ireland, Nigeria, South Africa, Brazil, Nicaragua, and the United States. Sixteen chapters consider the various antecedents of each country's native signed language, taking into account the historical background for their development and also the effects of foreign influences and changes in philosophies by the larger, dominant hearing societies. 344 pages.